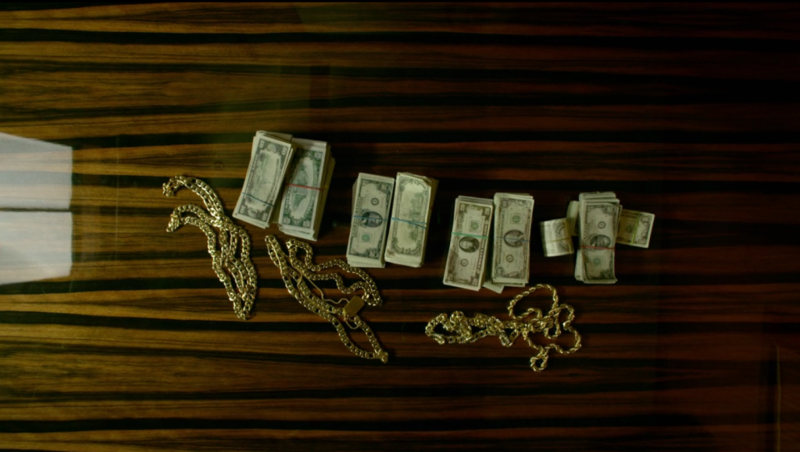 Part 2 of our Netflix-Marvel Luke Cage feature follows our interview with production designer Loren Weeks. 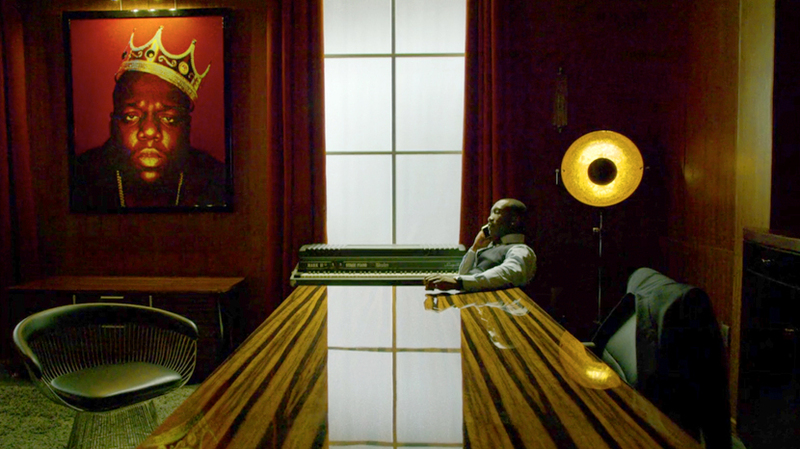 Here, Loren shares behind-the-scenes knowledge and helps us identify the cleverly chosen furniture, decor and lighting in Cottonmouth’s Harlem Paradise club and office. We show you exactly where to buy it. 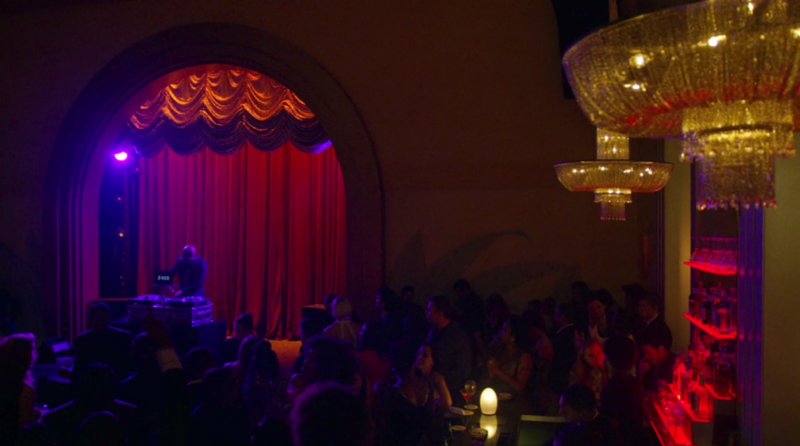 Cottonmouth’s Harlem Paradise club in Netflix-Marvel Luke Cage. Film still by Film and Furniture. Find 4 items in Cottonmouth’s Harlem Paradise club. 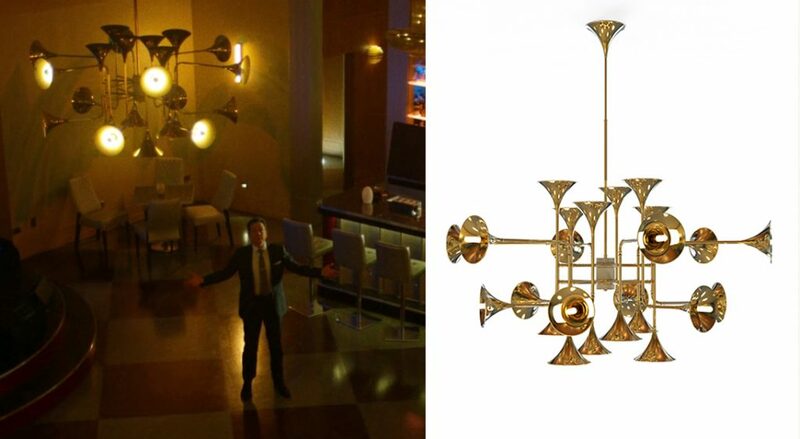 Cornell “Cottonmouth” Stokes’ Harlem Paradise club has a ceiling light with multi brass trumpets and is an inspired choice for the club. 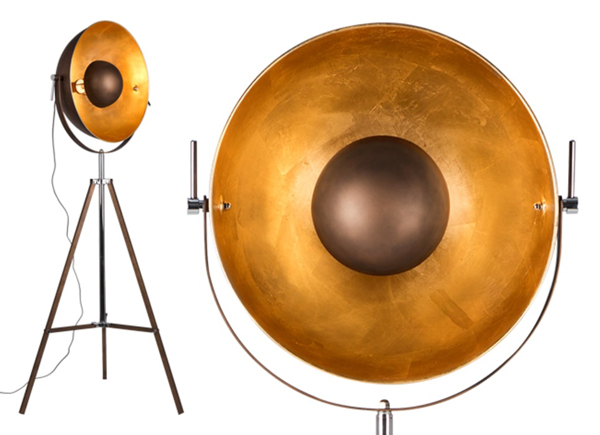 It’s a Botti chandelier by Delightfull, handmade in brass and gently covered by a golden mantle. A real statement piece. 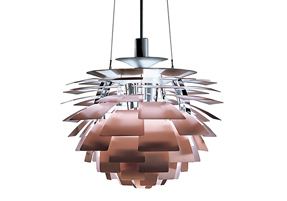 Botti chandelier by Delightfull in Harlem Paradise club. 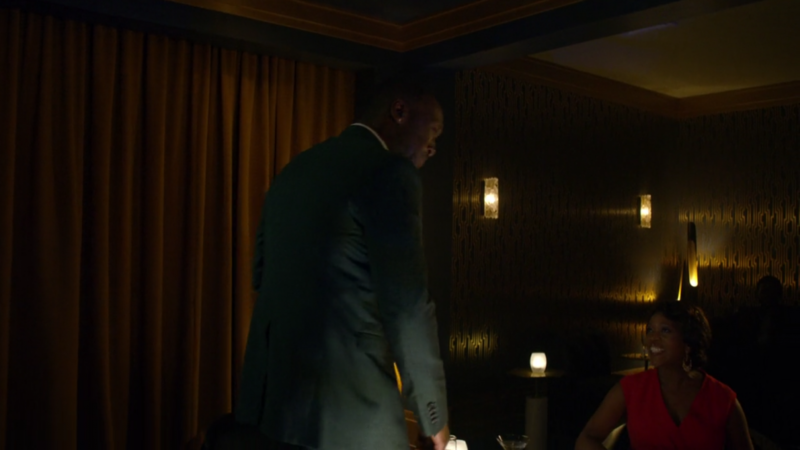 We love the fact Cottonmouth says himself in Episode 3 “When the lights are on you really can see things for what they are”. It’s like a speech to Loren Week’s production design! 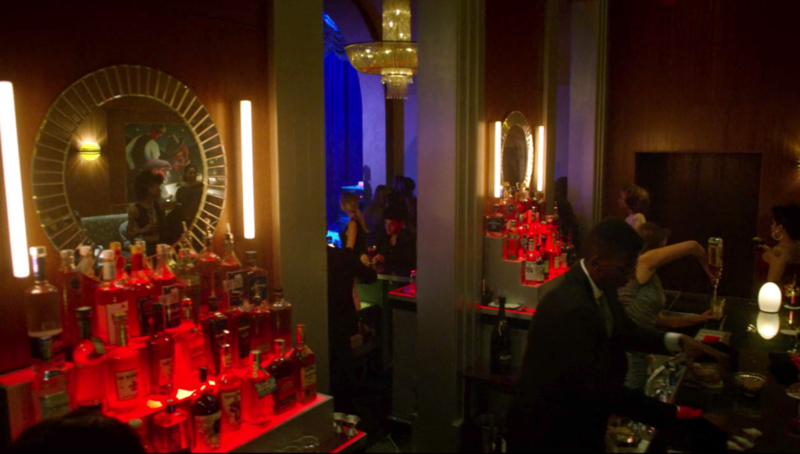 The bar area of Cottonmouth’s Harlem Paradise club. 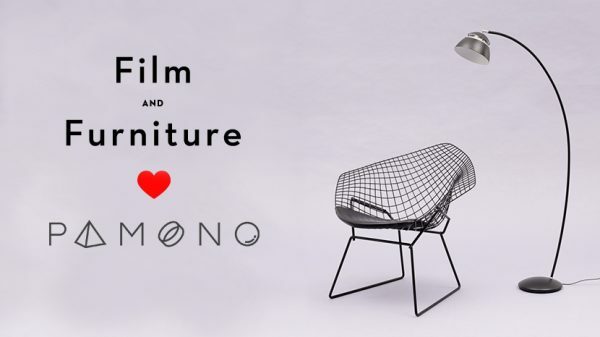 Film still by Film and Furniture. The round mirror behind the bar is by Williams and Sonoma. 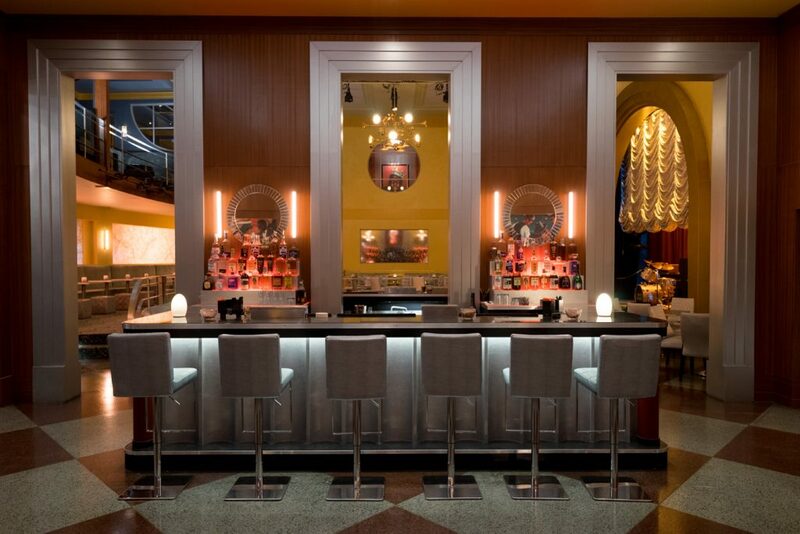 The silver bar stools and silver seating in the main club area are from Modern line Furniture based in New Jersey, USA. 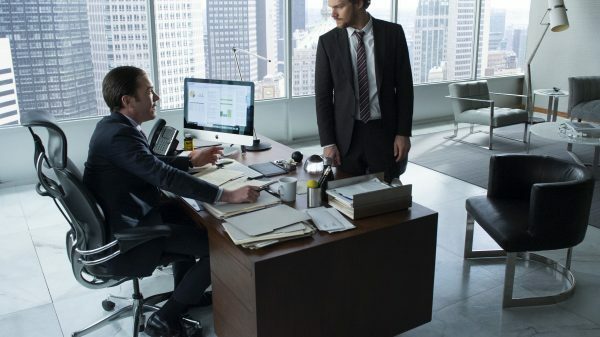 These were custom made for the Netflix series but the good news is that BCH Furnishings – the Couture Hospitality Division of Modern Line Furniture would be happy to make them for you. 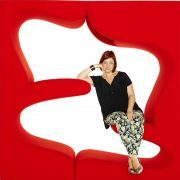 Check them out at BCH Furnishings. 4. 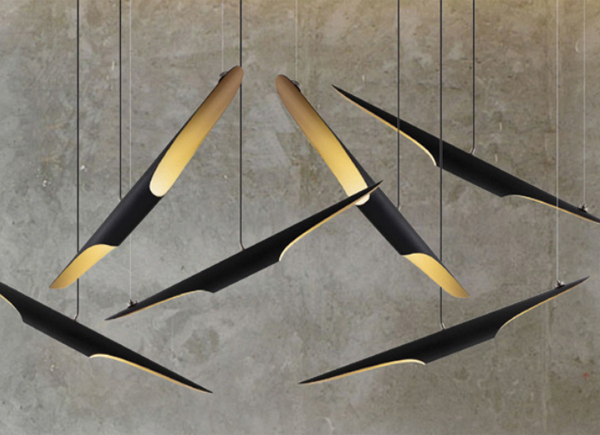 The Danish ceiling light. 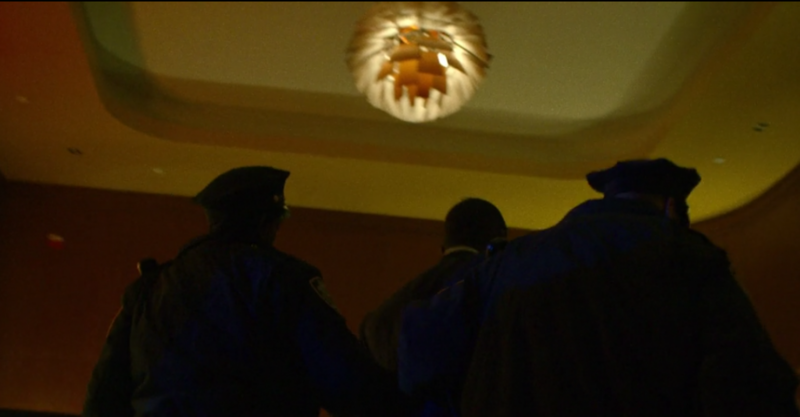 We also see glimpses of a PH Artichoke light in the club. 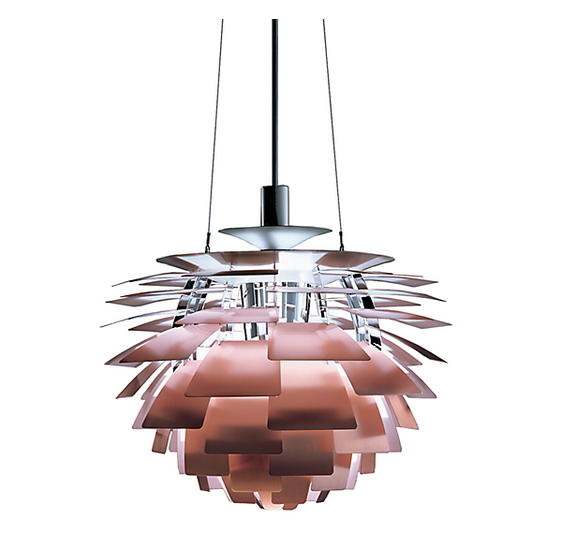 The daddy of ceiling lights, the Artichoke light is a Danish design which is widely considered to be a classical masterpiece designed by Poul Henningsen in 1958. The structure is made of twelve steel arches. On this structure Henningsen placed 72 copper “leaves” in twelve circular rows with six blades in each row. Because each row is staggered from the previous, all 72 leaves are able to “cover for each other”. This design allows viewing the fixture from any angle without being able to see the light source located in the center of the PH Artichoke. The original designs were developed for a restaurant in Copenhagen called the Langelinie Pavilion, and they are still hanging there today. In the upper balcony, Cottonmouth surveys his domain with pride whilst wheeling and dealing with invited guests. 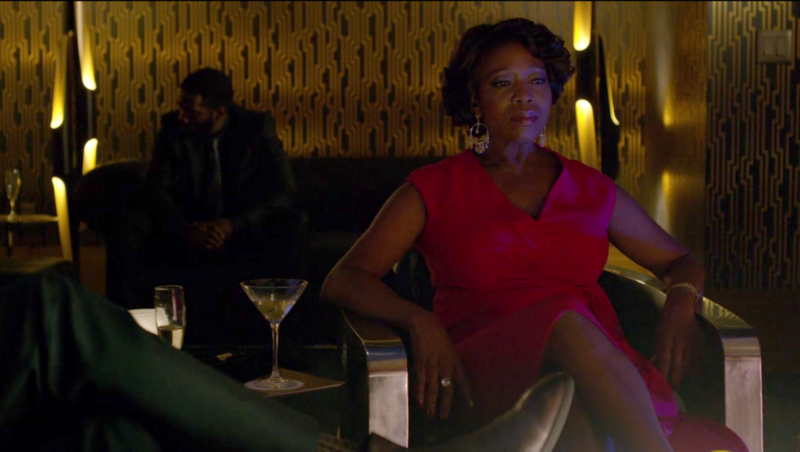 The eye-catching floor lamp seen above – behind Cottonmouth and Mariah Dillard (Alfre Woodard) – is the aptly named Coltrane and is made by Portuguese lighting company Delightfull. The name Coltrane instantly resonates with Jazz and is another inspiring choice for the club. 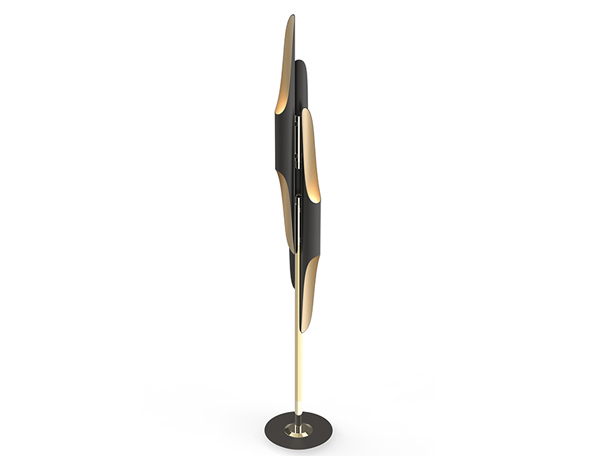 The body of this floor standing light is made in brass and aluminium. 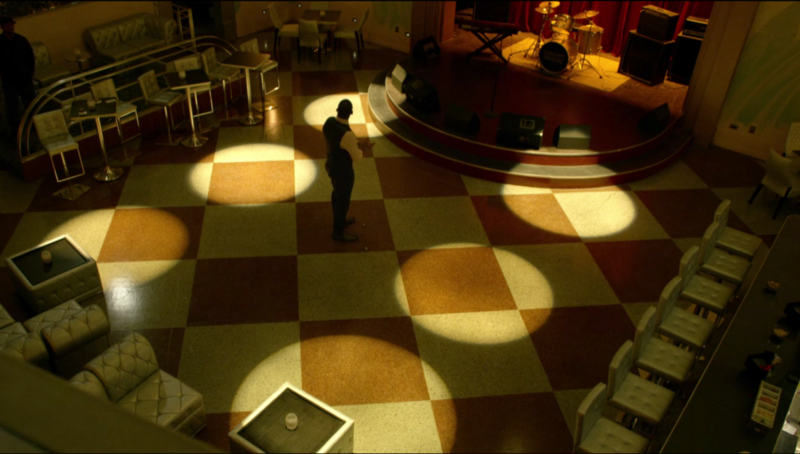 We see dramatic gold geometric wallpaper on the walls of Cottonmouth’s club balcony. 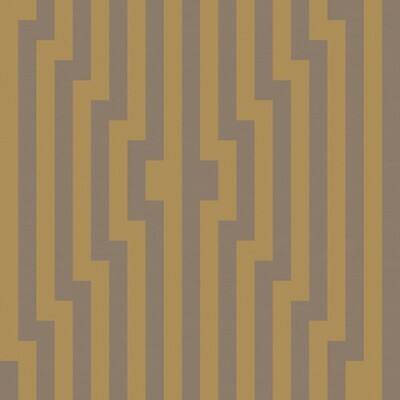 Find similar wallpaper such as this Diamond Stripe in gold from Cole & Son on Wallpaper Direct. 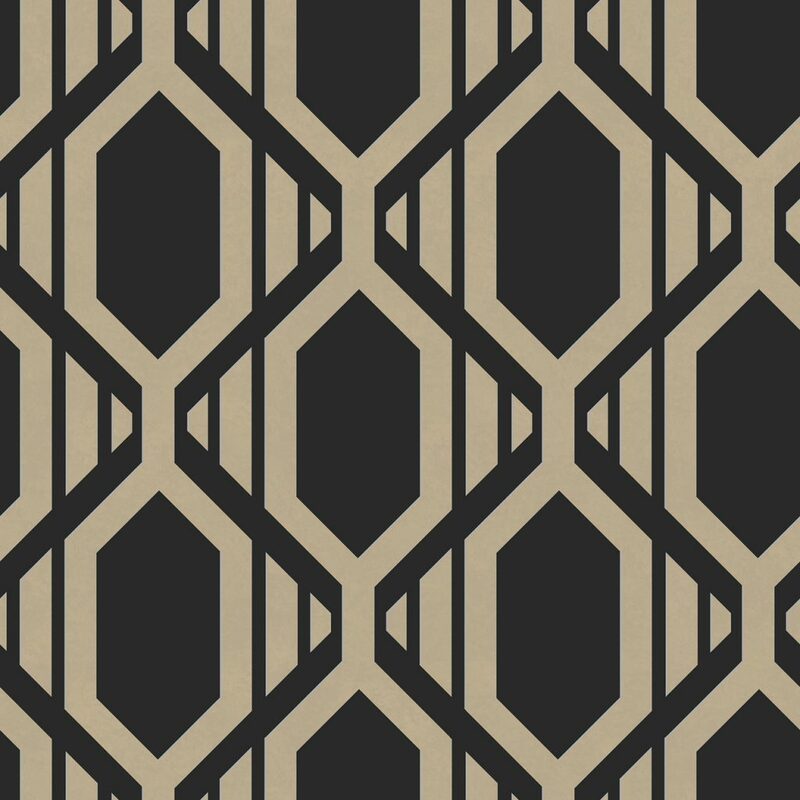 A striking all over art deco inspired geometric design of vertical waves and stripes is Geometric from Galerie available from Wallpaper Direct. 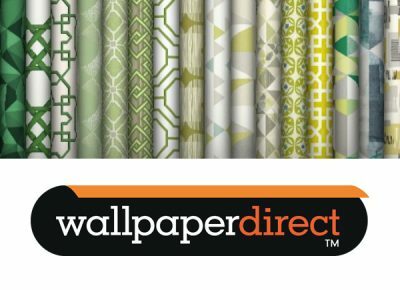 Geometric from Galerie available from Wallpaper Direct. 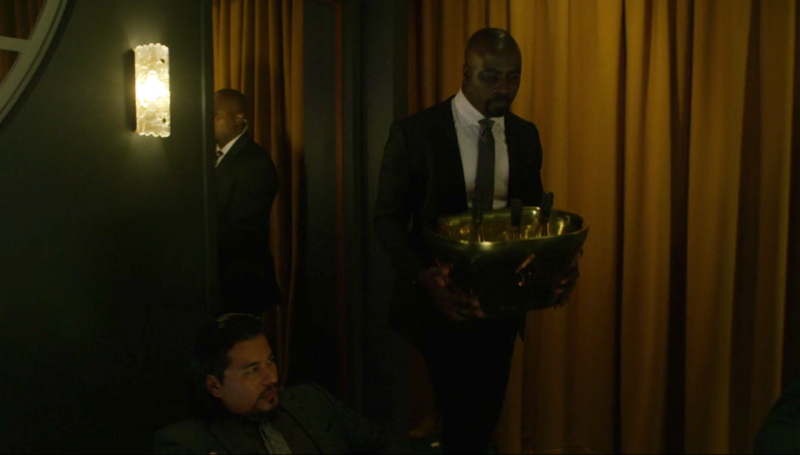 We spot these gorgeous textured glass wall sconces (seen on the left above) as Luke Cage brings Cottonmouth drinks to the balcony of the club. 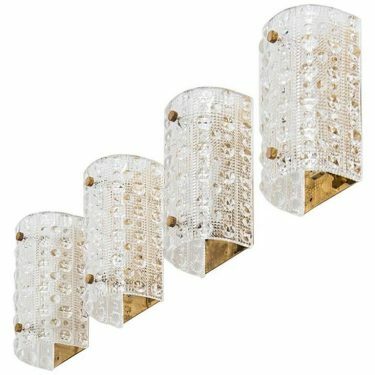 These wall sconces with beautiful textured glass on brass backs which feature in the balcony scenes are vintage pieces designed by Carl Fagerlund for Orrefors of Sweden in the 1950’s. Fagerlund’s glass is sought after and as luck would have it 1st Dibs currently have a set of four wall sconce/lamps (model RD 2002) designed by Carl Fagerlund and produced by Orrefors in Sweden. 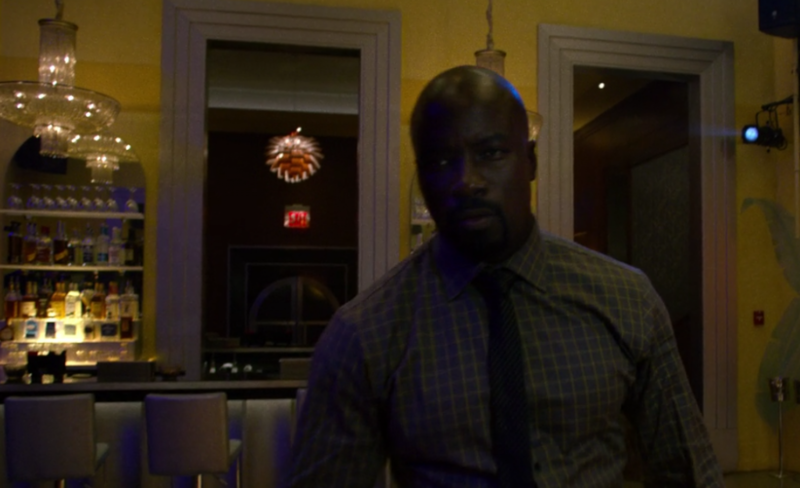 Not many can say they have the exact wall lights from Luke Cage’s Cottonmouth slick balcony room but that could be you! 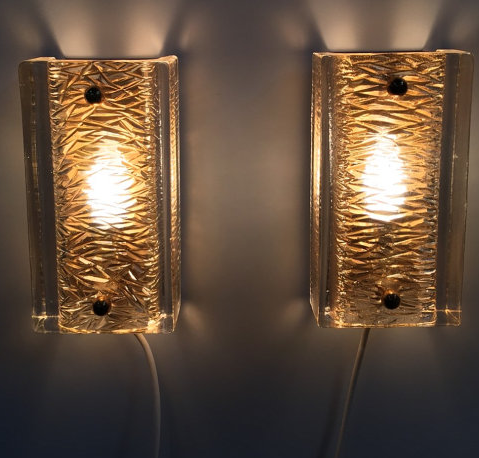 Buy the wall sconces: Available now from 1st Dibs. The commanding boardroom table/office desk, with carefully polished surface is a great choice for Cornell Stokes aka Cottonmouth. We love the way it reflects the rest of the room, the action and the Biggie Smalls painting – all of which, in turn, reflect the way Cottonmouth wants to be perceived – as powerful yet discerning. He demands respect. 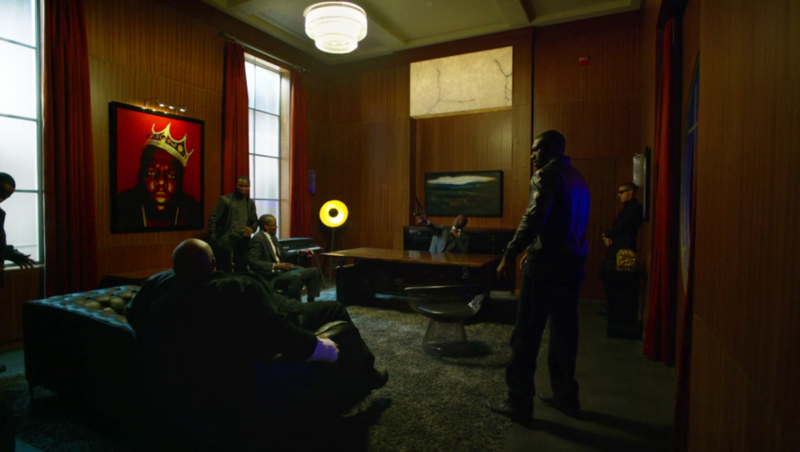 The table also makes a great backdrop for the scene where his gang pile up the fruits of their neighbourhood raids to try and send a message back to Luke Cage. The desk is a Nino D Modern Laquer desk available from Executive Desk Co. Incredibly sleek and shiny, this desk almost gives the appearance of a glass desk. Having a desk the same as Cottonmouth in your home or office would certainly be a story to tell. 2. The classic Mid Century Modern chairs behind the desk. 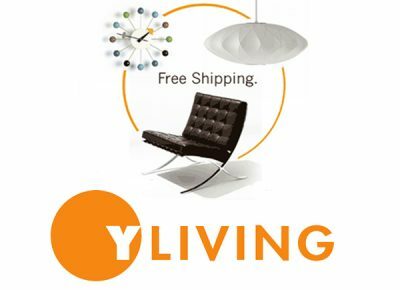 A more tasteful choice in our opinion are the two black and silver Warren Platner Knoll chairs. In 1966, the Platner Collection captured the “decorative, gentle, graceful” shapes that were beginning to infiltrate the modern vocabulary. The Arm Chair, which can be used as a dining chair or guest chair, is created by welding curved steel rods to circular and semi-circular frames, simultaneously serving as structure and ornament. 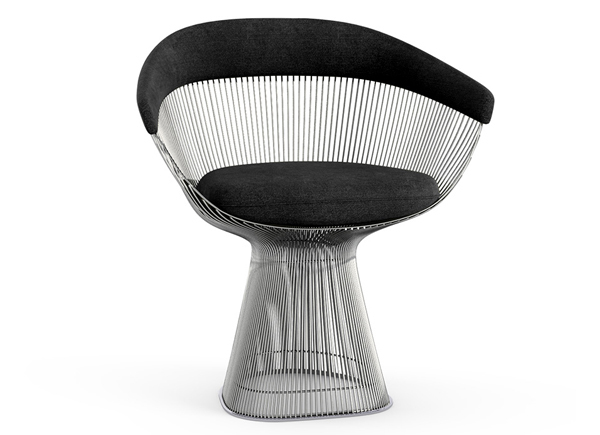 In the UK the Platner chairs are available from The Conran Shop. 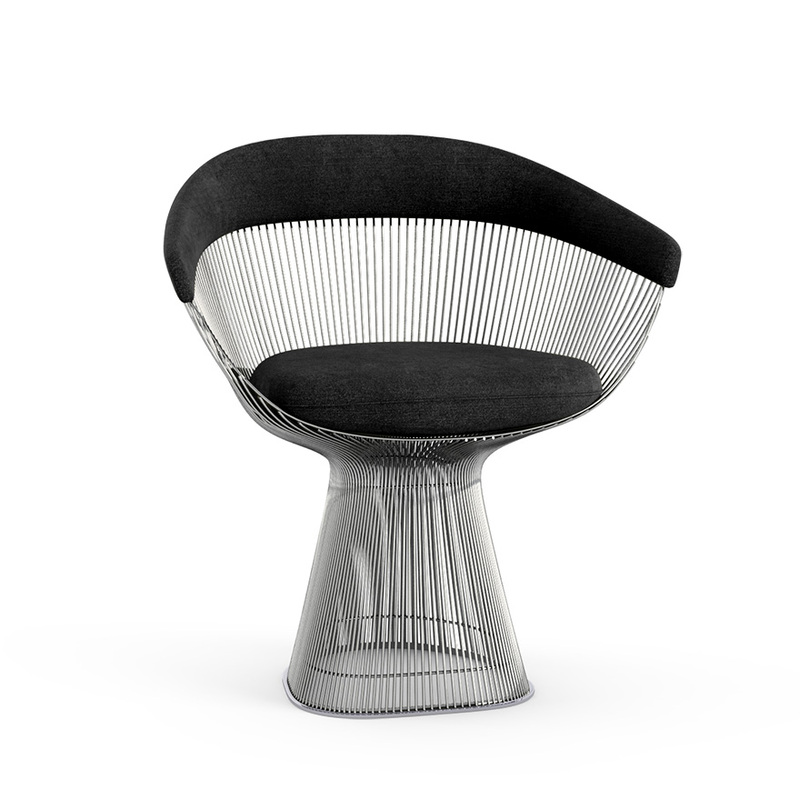 In USA the Platner chairs are available from Design Within Reach. 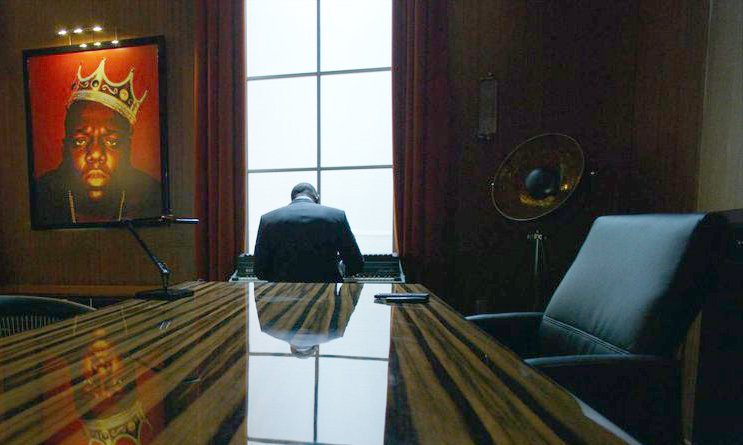 The wall lights in Cottonmouth’s office are from Hudson Valley Lighting’s McLean Collection. 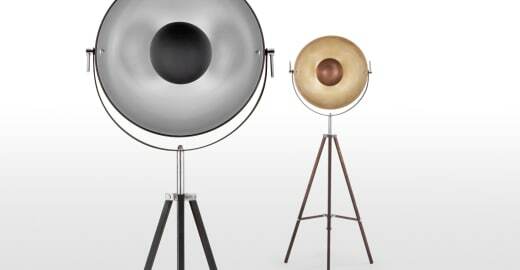 They come in two sizes, and in two finishes: antique polished Nickel and Polished Nickel. 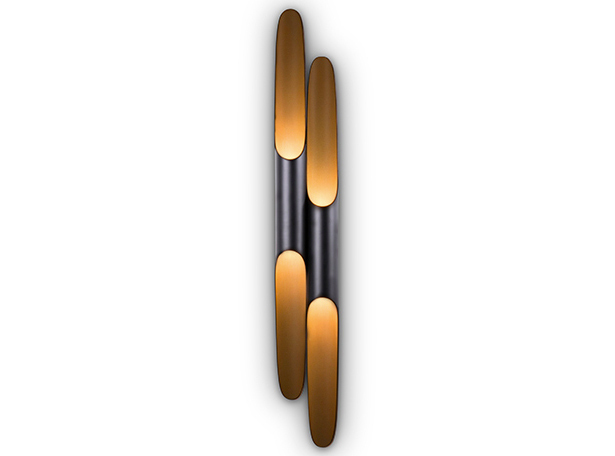 Cottonmouth’s wall sconces are polished nickel. 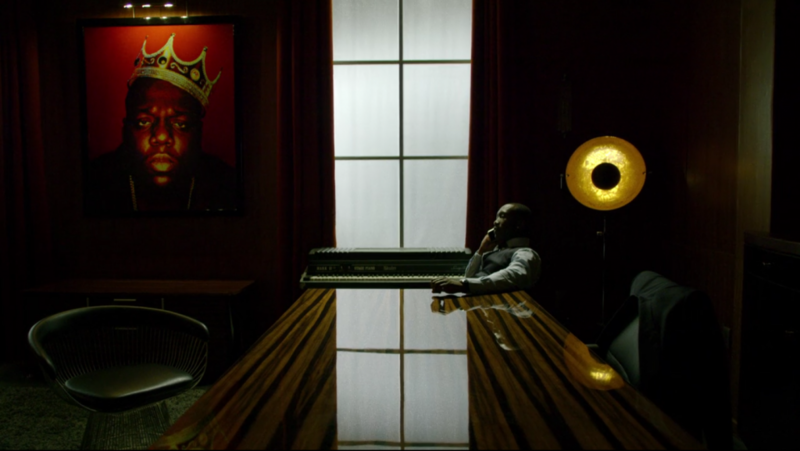 In Cottonmouth’s office we see an oversized floor lamp from France and Sons. 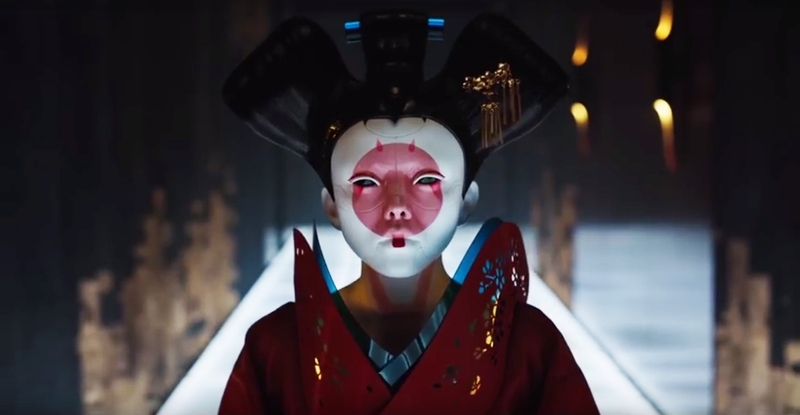 Film still by Film and Furniture. 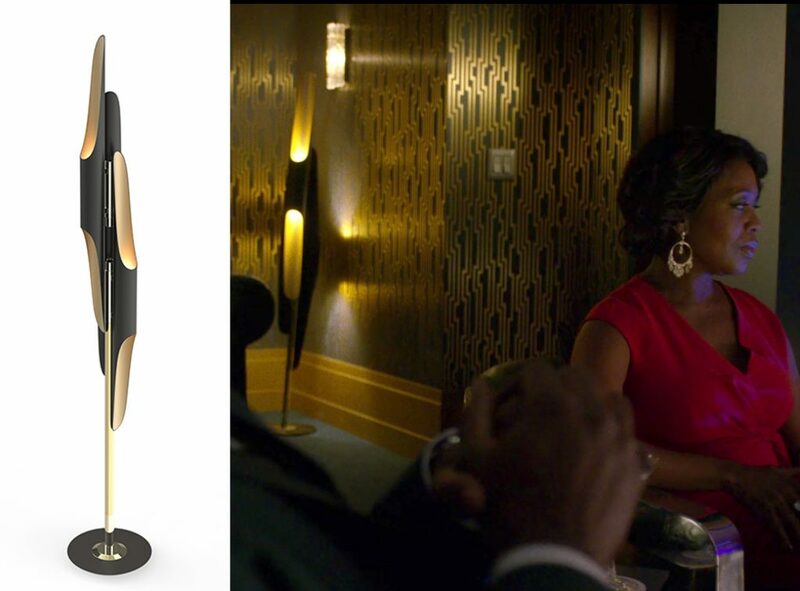 The bold oversized light in corner of Cottonmouth’s office is a Caela Floor Lamp in black and gold from France and Son. 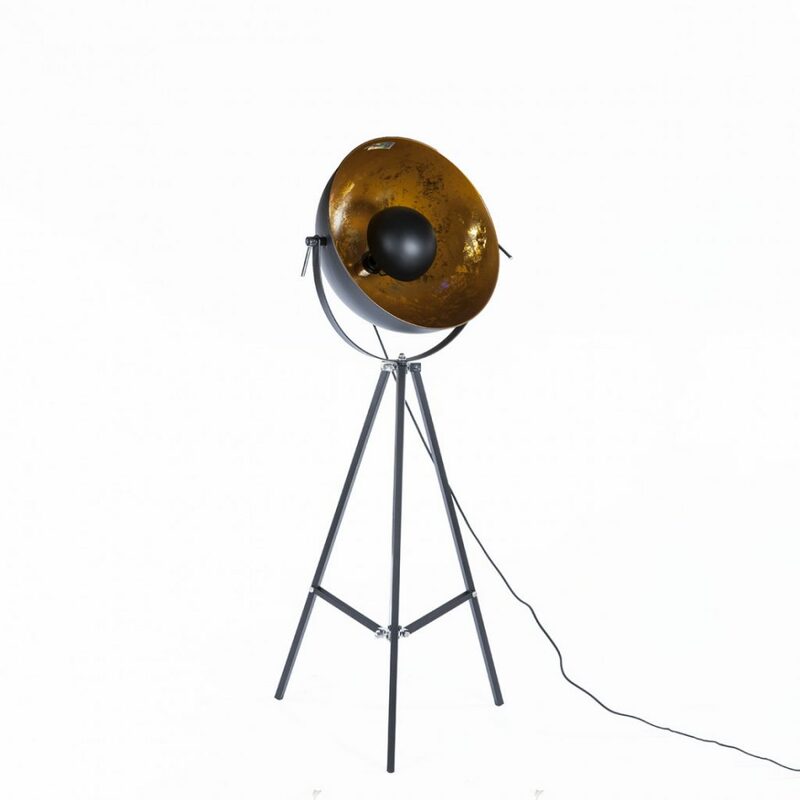 This large, contemporary modern floor lamp has an antique finished gold shade interior and a large semi-spherical adjustable shade. 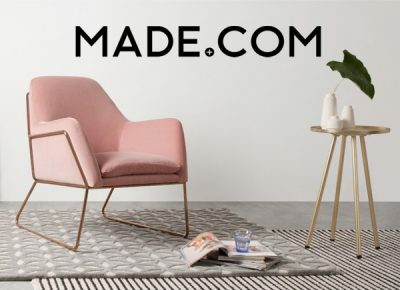 Made.com also have a very similar floor lamp called the Chicago. 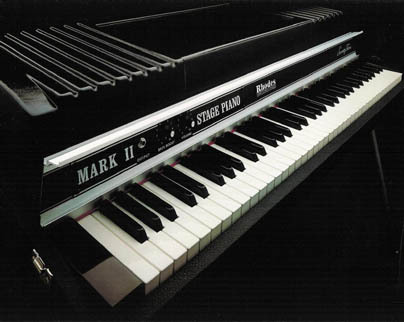 The synth/keyboard in Cottonmouth’s office (which is also played by a young Cornell in Mama Mabels house) is a Rhodes Mark II stage piano. Cheo [Hodari Coker] the show runner wrote the screen play for the Biggie film. 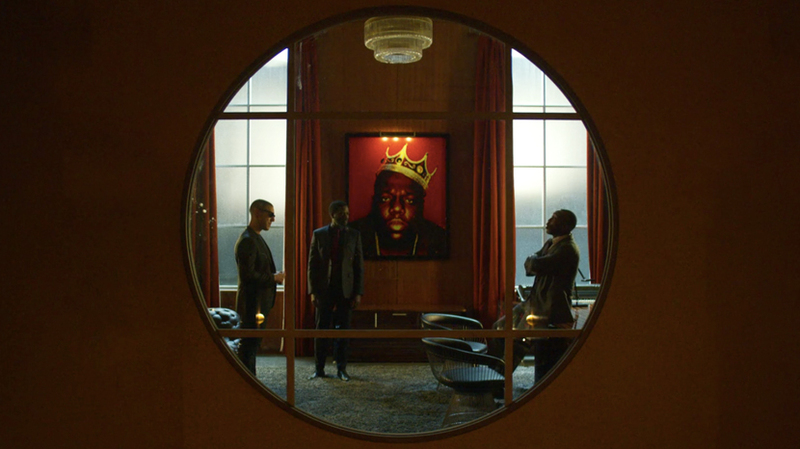 Cheo knew he wanted that Biggie Smalls photo by Barron Clairborne in Cottonmouth’s office from the start and discussed with us together with Mahershala Ali who plays Cornell Stokes (“Cottonmouth”) if we felt it was a good fit. Cheo then introduced the Luke Cage art department to the photographer to get clearance to use the image. It was important to Cheo to have that crown in the image because it played with the line by Cottonmouth “Everybody wants to be the King”. 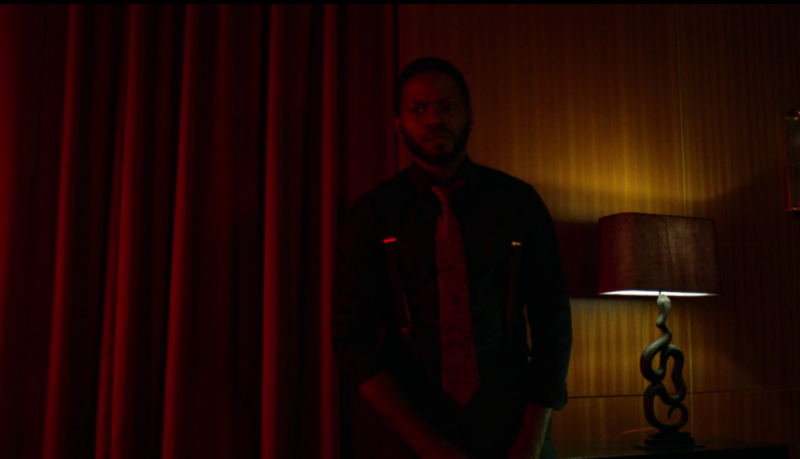 The snake lamp, seen on the right here, speaks volumes about Cottonmouth’s character. Film still by Film and Furiture. The snake lamp is made by Arteriors, but sadly is no longer made. 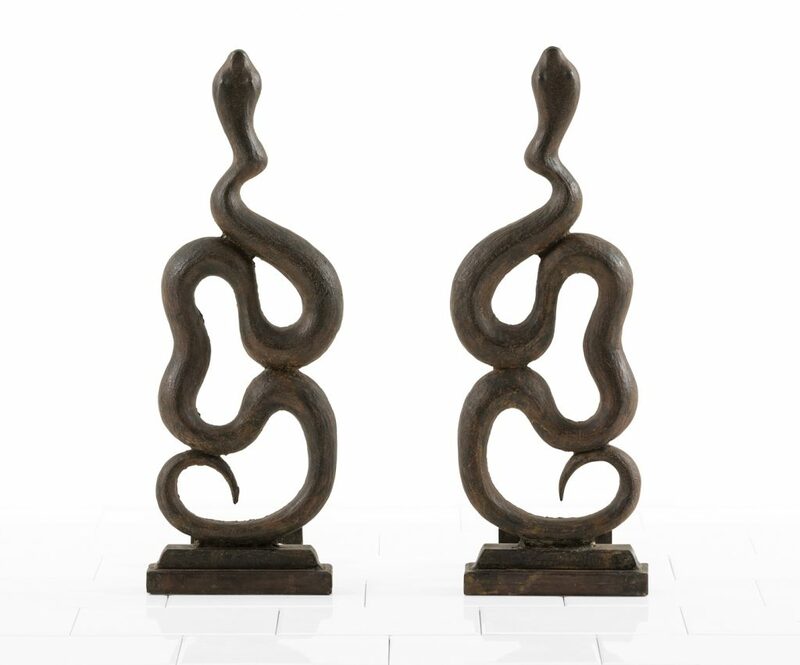 However, Arteriors produce fireplace heath andirons with exactly the same snake design they used to create the lamp bases. If you were feeling creative (or if you know someone who is) you could make your own Cottonmouth lamps from these cast iron Andirons. 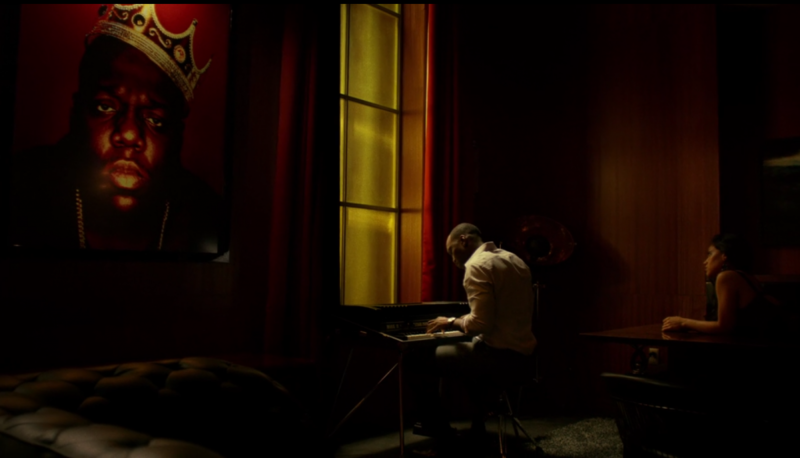 The sofa in Cottonmouth’s office in Luke Cage. 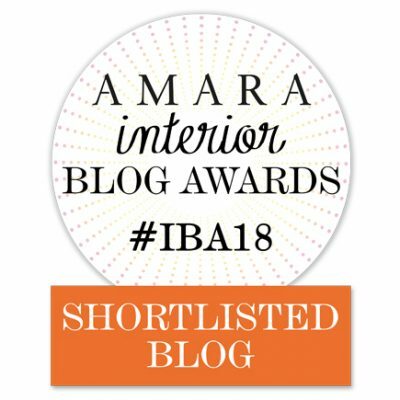 Find details where to buy this exact sofa below. 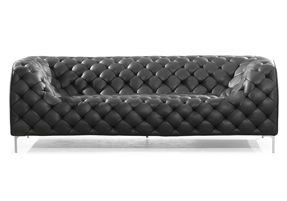 This sofa is a contemporary take on a chesterfield called Providence. Made by Zuo-Modern, the sofa which looks green in Cottonmouth’s office, is actually black and is also available in velvet and in gray, blue and white too. 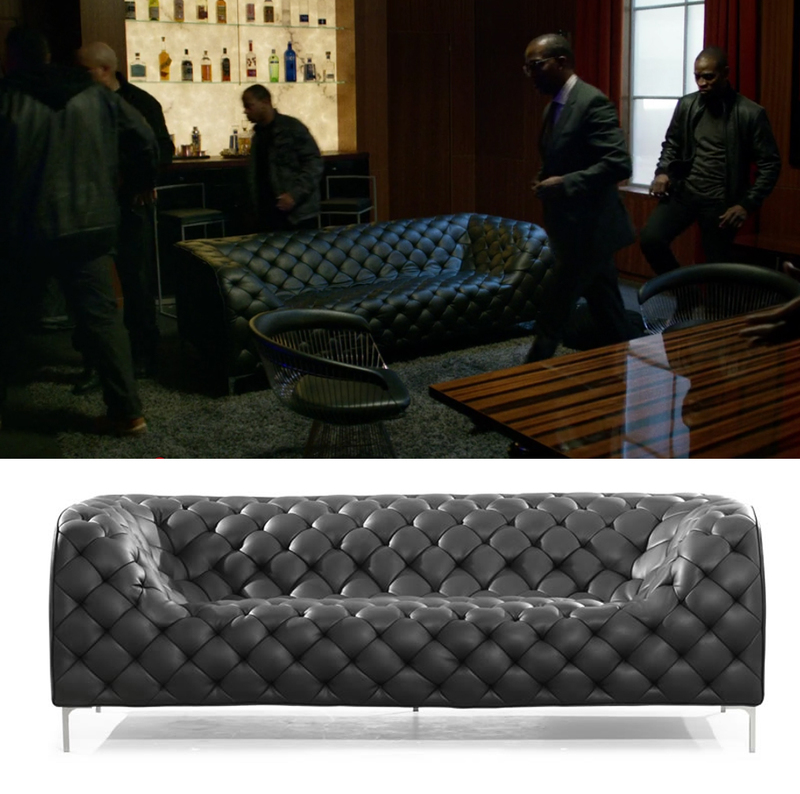 Luke Cage Production Designer Loren Weeks tells us “One reason I liked this sofa for Cottonmouth’s office was because it made me think of snakeskin”. 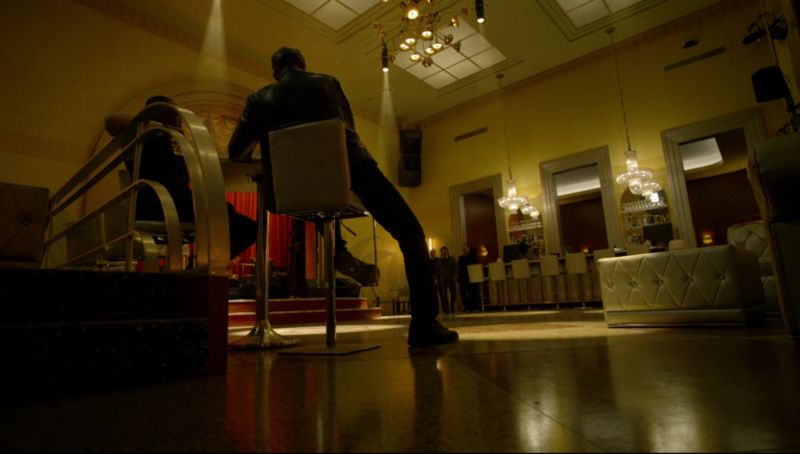 We thank Loren Weeks and set decorator Alison Froling for sharing their insights and behind the scenes knowledge on the production design and set decoration of Luke Cage. 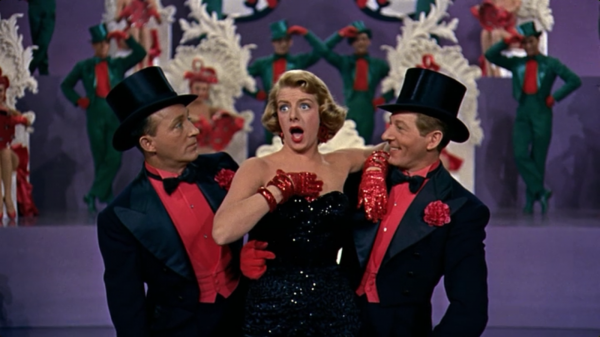 Their talent and skill create enormous atmosphere and communicate non-verbal stories about the characters. I’m dying to know about the box Cottonmouth kept his (first murder) gun in. Hi Jennifer. We’ll see if we can find out about it for you. Fresh designs by unique talent. 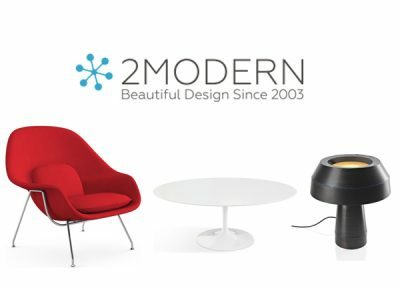 Tried and tested by Film and Furniture, the quality is very impressive and we’re hooked!